Kirito, Eugeo, and Alice confront Chudelkin and the Administrator at the top of the tower. Episode 21 - "The 32nd Knight"
One thing I'd been curious about is the Administrator's personality. The original girl Quinella has been alive for a long time, faced mortality before finding her fountain of youth, and has been Underworld's god for the better part of 300 years. What is left of that weird, talented girl who used to kill animals in the forest? Does she have any other motivations beside control? We don't have a clear picture yet from this episode, but she is very perceptive and knows exactly how to push the buttons of others who appear to have empty parts of their psyche. She used that talent in a rushed way with Eugeo, which didn't work thankfully, and she has Chudelkin totally under her thumb, or feet, or whatever is floating his boat these days. One thing is clear about the Administrator - she's aware of a lot of things, including where the Cardinal is holed up and who created Code 871. I wonder if her rule over this land hasn't been aided from the outside by one of the developers of Underworld. We'll find out soon enough. There's new artwork in the opening credits, adding to the background of the same elements we've seen previously, but they're calling this arc Alicization Uniting. The OP is spoiler rich, with pontifex fighting Kirito naked and the weapons along the wall turning into some blade monster. Kirito tried to provoke a memory response in Eugeo, where he's basically throwing spaghetti at the wall to see what sticks. Kirito isn't thinking straight. 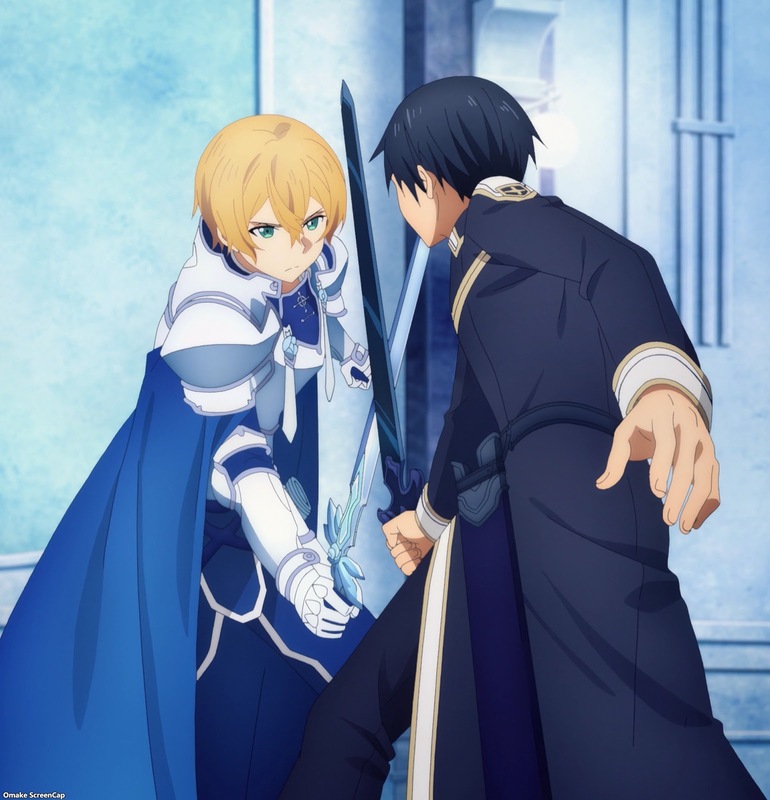 What's the point of knocking Eugeo's sword away when he already saw he could retrieve it magically? If he could pull something toward him, why not push something away from him, like Kirito himself. It's like we're back to the Jedi references from the Gun Gale Online story. Alice is saying something something important - brand new Integrity Knights shouldn't be this strong. Kirito thinks his sword wants a name. It looks like Kirito's tugging at Eugeo's memories worked. We'll have to see after the ice melts if that's true or not. This is a classic double agent adventure story plot element. See? Eugeo wanted to take out the Admin himself after he saw Alice was actually on their side. He didn't need his dagger for her any more. Too bad the Admin has some extra tough skin now. Here's some nice continuity. 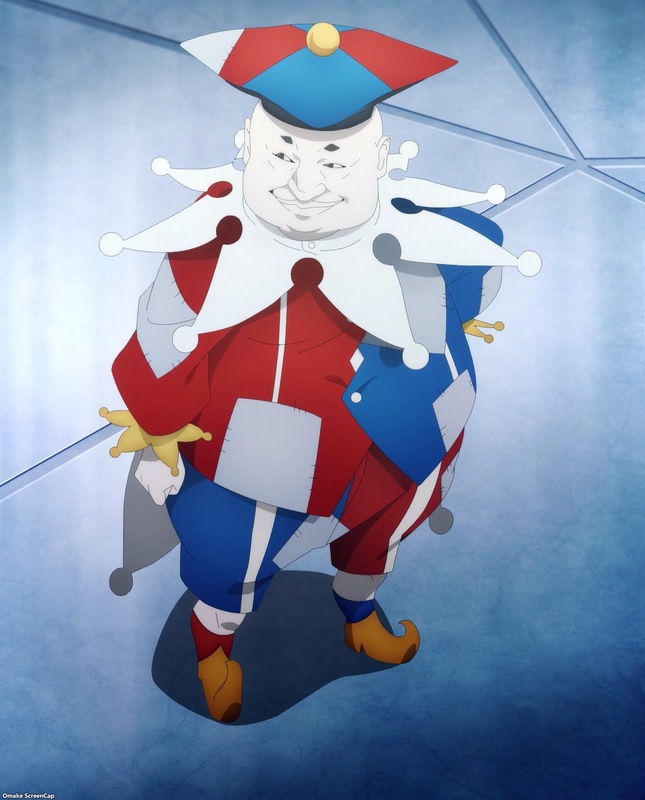 Chudelkin had to patch up his jester suit after he blew it up escaping from his room. Admin says she rushed Eugeo's synthesis and wants to do it over. That may explain how Eugeo partially broke the Piety Module so he could let Kirito and Alice escape his ice without the crystal leaving his forehead. Maybe the Admin forgot to remove his memories of those important relationships instead of just cutting them off. Eugeo even regained memories of the young Kirito before Alice was taken. I don't think Kirito even has those. This Power of Meaning to make stronger Integrity Knights sounds important. We'll get an explanation much later. Ah. Dagger can't work on Administrator. She says no metal can pierce her skin now, but maybe Alice can turn into some other kind of material that will work. Pontifex really doesn't like clothing. Good news for us and that pervert Chudelkin. Eugeo can't accept that transactional view of love, that to love is to control and be controlled. Good for him, but he bought into it just before he was turned into 32. Alice's forced synthesis was done by the senators over many days while the Administrator was asleep. Has she not done a forced ritual herself? Will she explain why she sleeps all the time, or is the memory degradation explanation that we got with the Lift Operator good enough? Ha! Chudelkin is in trouble. And he's all thin now too! What is that about? Eugeo's a traitor, watch out! I think pontifex knows that by now, Chudelkin. Nice comment about Bercouli and Fanatio needing to be reset. It looks like developing too much of a personality leads to questions. Can't have that! Alice is ahead of schedule, perhaps due to that "irregular unit." Kirito... Can the Admin not tell he's not an NPC? The Admin is surprised Alice is functioning after the Code 871 manifested. Her logic circuits are working (unlike what happened to Raios) and her Piety Module is still there too (blocking her memories). "That person" created Code 871, which Alice seems to have disabled. Let's find out who "that person" is, okay? And Chudelkin is just your average pervert masochist. If Pontifex doesn't care about her naked body, she definitely won't care about showing it off to Chudelkin for a night. Ugh, though. 300 year old fake body. And Chudelkin's loins are literally on fire. Next time, all those weapons along the wall are going to be turned into some kind of monster.